I needed to use up some of the frozen squid hiding out in the back of my freezer and this recipe from Cuisine did the trick. Heat oven to 180oC and place tomatoes in a small baking dish with a drizzle of olive oil and sprinkle of salt and freshly ground pepper. Roast for around 15 minutes or until tomatoes are slightly golden. Cool then place on a serving platter. Put potatoes in a saucepan of salted water & bring to boil until tender, about 10 minutes. Drain well and crush slightly with a fork and add to platter with tomatoes. Heat 1 tbsp olive oil in a medium-hot fry pan and fry chorizo for 4-5 minutes until crisp. Set aside & add to dressing. 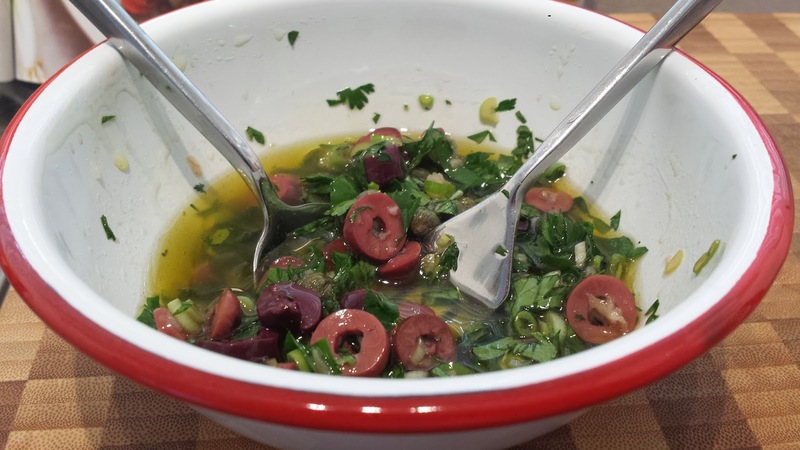 olives, garlic, capers & coriander in a bowl and mix well. 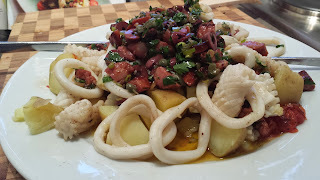 To cook squid: Heat a heavy frying pan until very hot, season squid pieces then fry until they are slightly brown, only takes 1 minute as you do not want to over cook. 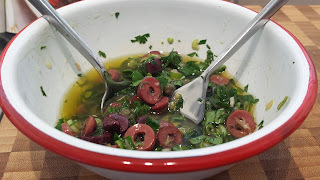 Add to platter then spoon over dressing. Enjoy!